The Rescue Stock Yard (RSY), our NPO based in Nagoya, has been supporting the management of Shichigahama Kizuna Kobo, i.e., the Cooperative Craft Studio. 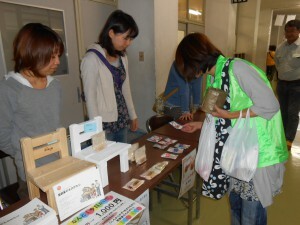 Recently, we organized exhibit booths for Kizuna Kobo at some events in Nagoya, including Environment Day Nagoya on Sep15 (Sat), Disaster Prevention Fiesta 2012 at Nagoya TV Tower on Sep 28 (Fri) & 29 (Sat), and Kumaiden Disaster Prevention Academy in Nakagawa Ward, on Oct 14 (Sun), 2012. The most popular product at these events was the FukkoSweets. Fukko Sweets were developed after the disaster through a special collaboration between Confectionary Firenze in Nagoya, Yamada-gumi Inc., Nack Planning Inc., the RSY, and Kizuna Kobo. The cloth bags and the draw-string pouches that came as a set with the sweets had embroideries of Mr. Frog, the image character of Kizuna Kobo. Mr. Frog was designed with the hope that smiles and a sense of fulfillment in life will “come back” (or kaeru, the Japanese verb for “to return” which is pronounced the same as the Japanese word for frog) to Shichigahama. A customer said, “These items show how earnestly the members of Kizuna Kobo engage in their work,” looking at the products thoughtfully. “I could visualize them working. I’d like to offer what little support I can.” Children were saying innocently, “Mom, it’s cute! I want this!” I was impressed to see each of the customers respectively appreciate the thoughts of the members of Kizuna Kobo which were reflected in their crafts. This relationship, which is not merely a one-way traffic, is greatly encouraging the people in Shichigahama. 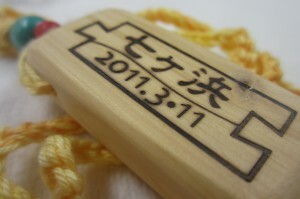 Handicrafts produced in Kizuna Kobo are “messengers” that connect the people in Shichigahama to those who would like to support them from distant places. 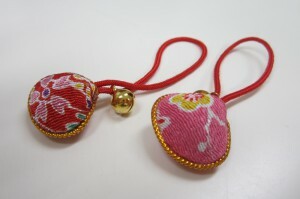 We will continue to introduce these handicrafts to more and more people. Fukko is a Japanese word which encompasses the meanings of reconstruction, recovery, rehabilitation, and resurrection, often used in the context of post-disaster situations. I know how much happiness and fulfillment my craft hobby gives me, so I truly know the value of the Cooperative Craft Studio. The members must experience peace and healing when they work on their crafts. It is wonderful that Rescue Stock Yard sees the value and supports the group.